The organization of space in the house is always an easy task. If the area of ​​housing is small, then this issue becomes even more difficult. 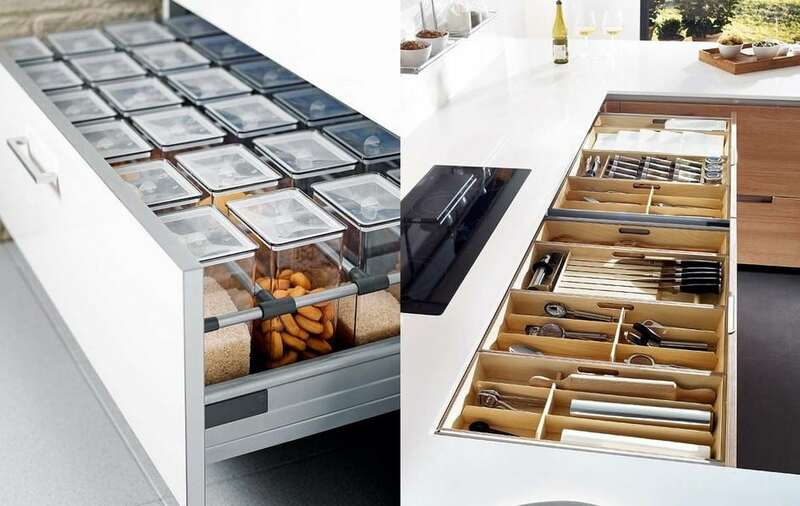 Therefore, original ideas for storing things, such as transforming furniture or various ways of using each centimeter, are becoming increasingly popular. In general, there are many options to save space. In order to organize the storage of things in the apartment as efficiently as possible, you need to have an idea about all sorts of methods. Then all items will be conveniently placed: without disturbing you, without cluttering up space, but always at hand. To save space you need to start with large-sized items, ie, furniture. Unconditional leaders in this issue - built-in wardrobes. Most often they are used to store things, books, dishes in a small apartment. Built-in wardrobes seem to be part of the room itself, have small dimensions, allow efficient use of niches, corners and other complex space. In the built-in wardrobes it is convenient to place various items, clothes, things, books, shoes, dishes. Such furniture is especially good for a small apartment, since it does not visually reduce the area. To make the most efficient use of the space reserved for built-in modules, it is necessary to properly organize the space inside them. This will help all sorts of systems and ideas of storage, baskets, shelves, boxes, drawers, etc. It is desirable even at the design stage to decide what will be stored in the cabinet. Then you will not have to adapt to the internal space of the module, on the contrary, it will be made taking into account the wishes of the owner. The built-in furniture hides easily household appliances, for example, washing and dishwashers, microwaves and ovens. They do not occupy a separate place and become part of the interior. Very comfortable furniture in which the traditionally unused space turns into a place to store things. For example, padded stools can be soft and comfortable seats, and a small box for household chemicals. Also used under the bed or place inside the seats of the kitchen corners. Many people like pedestals on wheels: they can be easily moved from place to place, a huge amount of small things can be placed in the drawers, and the base itself can be used as a TV stand, bedside table, etc. The space under the bed in the bedroom is usually used to store laundry. However, bedding is rarely when they take up boxes completely. The remaining space can be used for other things, for example, spare or additional blankets and pillows, clothes (boxes with dividers will be useful here), and if possible, even make a shelf for books. Most often for storage are used cabinets and open shelves. However, even their large volume does not guarantee that everything will have a place, and the space will be used with maximum benefit. 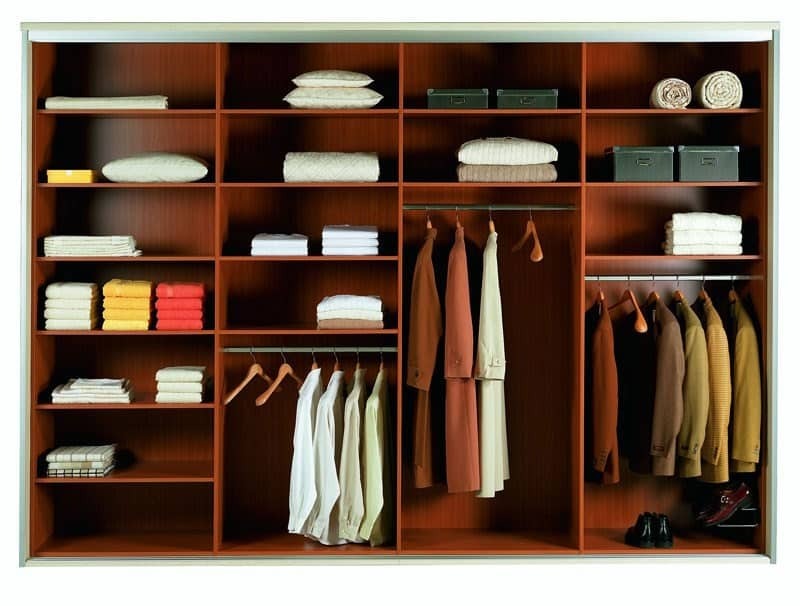 In organizing the space in the closet will help storage systems, made by hand or to order. In the large closet must be a department for things stored on hangers. Usually, even winter jackets have enough height 1,4 m. The space under them can be divided into shelves and adapted for tools or shoes. For socks and underwear is better to use shallow boxes. To prevent garments from being confused and intermingled with each other, you can use special separator grids. Of course, one can not do without shelves where everyday wardrobe items will lie. Their number and depth are selected depending on individual needs. In the upper part there are usually also free shelves. Since often jumping under the ceiling is not a pleasant thing, this space is usually used to store seasonal items: hats, shoes, sports equipment, and tourist equipment. Also here they store things that are not always needed, but are used occasionally, for example, additional pillows and blankets, and mattresses. Often on the shelves, where a large number of small things accumulate, it turns out to be a mess. To avoid this, you can use special boxes for storing small items. They can be of various shapes, with and without covers. You can divide objects into categories and put them in boxes of different colors. So finding the right things will be easier. Most problems arise with the placement of all necessary in the kitchen. In a small room should take its place products, groceries, utensils for cooking and serving, seasoning, spices and accessories. Of course, the main store is a set or simple wall cabinets or any other piece of furniture. However, often used and open shelves, because they do not weigh down the space. In addition, the kitchen has many places where you can arrange the necessary items. Thus, in almost all homes there is a niche under the window, which can be converted into storage or storage. For example, they will find their place of harvesting for the winter or stocks of sugar or flour. Here you can keep some vegetables and fruits, because the temperature in the niche under the window is slightly lower than in the apartment. Here vegetables and fruits will be well kept. A good idea for storing covers - narrow pull-out sections, they take up a minimum of space, and can accommodate a lot of items. Retractable shelves - another original and convenient idea that simplifies access to the contents of the cabinet, especially deep. Thanks to them, you can easily get any object from the cabinet or arrange the dishes more efficiently. Many problems arise with the place near the sink: there are usually various detergents, there are brushes and sponges. As a result, the surface is filled with various trifles that instantly disperse throughout the space. To avoid this, you can buy a small basket and make it all the accessories for washing dishes. In plastic containers you can store various small things for the kitchen: from recipes and clippings to spices. Another idea of ​​storing small items is small clamps on the doors. For example, you can put a board here or stick a hook and hang a ladle on it. In modern small apartments, especially studios, racks are often used for zoning rooms. They help to divide the room according to the functions performed. Of course, various items are stored on the shelves of the shelves: souvenirs, books, photo frames, toys, vases of flowers, etc. With the right approach, everything standing on the shelves can become part of the interior. If any trinkets need to be hidden from prying eyes, then you can put them in an opaque container with a lid. In general, the same rules apply to the shelving as for open shelves and cabinets. However, storage ideas are usually more diverse. In a small apartment the size of the bathroom is very small. Often it turns out to be combined with the toilet. A bath accessories for each person a lot. And this is not counting the household chemicals needed for the bathroom. Therefore, the issue of the placement of bath accessories is always urgent. The first and most common option is a shelf or cabinet over a bathtub or over a sink, where shower gels, bath or shaving foams take their places. However, you can hang a mirror on the wall, and behind it make a locker for all these little things. Hooks and pockets are indispensable here for storage. So, on the hooks, you can hang towels and marks. Towel holders can be fixed on the door, and for washcloths - above the bath. There is always a free wall behind the toilet. It can be used for any of their needs. For example, there you can hang a large box for household chemicals or make a shelf for a laundry basket. 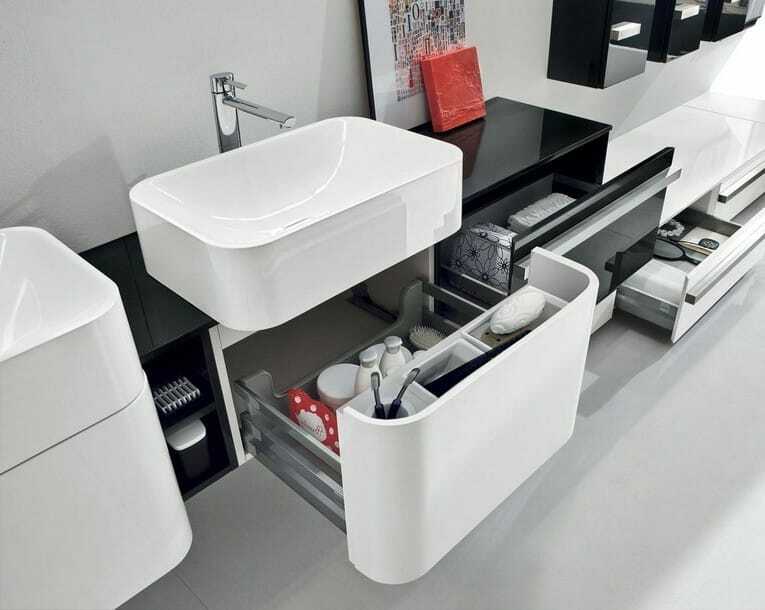 The space under the bathroom should also not disappear: it can be closed with a screen, it will function as a door, and under the bath itself you can create everything you need to wash: basins, powders, soap supply, etc. Modern storage systems allow to solve practically any issues related to the organization of space. It is only necessary to decide what exactly should lie in a particular place, and constantly maintain order. How much I bring up myself and my family - if I took something from the closet, put it in the same place! But this, apparently, is available only to people with a high level of self-discipline. Our family does not belong to those, so we have to periodically arrange general cleaning in the cabinets.